This function is optional, its activation requires additional licensing. The SL NEO platform allows the user to implement automatic generating and multiplexing closed captions in the DVB/IP transport stream. The platform supports up to four captions streams for every DVB service. Generation of captions is implemented according to the normative document ETSI EN 300 743 (Digital Video Broadcasting (DVB) Subtitling). The SL NEO platform supports both SD and HD formats, formats of initial files with captions - SRT. For generating DVB-captions, a program channel (the service Program Player) and the service AV/TS Player that forms the IP UDP/RTP transport stream, should function in the system. Let's configure a rule, according to which, in case if a certain column of a playlist line contains a flag, the service AV/TS Player that forms the output stream, will receive the command for generation of captions. The procedure is implemented from the control web console: menu item Manage, tab Program Outputs. Find the tab Actions in the chosen program channel, click the item Playlist Events. Choose Add Action. In the opened window enter the parameters of a new rule to manage playout of captions. In the window Action Configuration, enter a random name for the rule into the field Name, choose “1” (the main fullscreen layer) in the field Layer. Specify the server IP address in the field Address, or leave the field empty if the value is localhost. By the button ... in the field Service choose a service that forms the output stream. In our example, it is the output playout channel #1 (Playout_1 on the list). In the field Action set the action that will be implemented by the service Playout_1 in case of coincidence of the condition - Play Subtitle. Open the field Variable in the window Action condition and specify the playlist column that will be responsible for generation of captions: for example, the column GPI 1. Set the trigger as EQUAL, enter on into the field Value. Activate the parameter Trigger at start when primary matches. The implemented settings in the window Action condition mean that the rule will trigger and generation of captions will be allowed in case, if the value "on" will be set in the playlist column GPI 1. The rule starts synchronously with the start of playout of the main playlist events (the parameter Trigger at start when primary matches). In the field Param 1 of the window Action parameters you should specify the name of a SRT-file - the source of captions for the appropriate on-air event. Let's set the following rule: the root part of names of SRT-files (the sources of captions for the on-air events) should be identical to the unique identifiers of the on-air events in the playlist (the field Media). To implement this, press the button ... and choose the value Media URL from the list. Open the field Param 4 and specify the position that will start reading off the text from the SRT-file (optional parameter). By the button ... choose the value In Point from the list. The set parameter means that the position, from which the server will start reading off the text from the SRT-file, will coincide with the value In point in the playlist line. This adjustment will make possible cutting playlist lines and insert of commercials into the movies, as captions. The procedure of configuring the function of forming DVB IP UDP/RTP and network broadcasting is described in details in here. Configuring the module AV/TS Player for generating captions is implemented from the Administrator Control Panel, as an administrator. After the login to the control console, choose Manage at the left menu of the console. Choose the tab Video IO Boards: if the service for encoding to the network is present in the system, press Edit in the window LAN Interfaces/Ethernet Adaptor. Let's consider an example of configuring three caption streams for Russian, Ukrainian and English languages: open the section MPEG2 TS Parameters and find the tab Subtitles. In the field Subtitle Streams specify the number of streams with captions (three), in the item Stream 1 set the parameters for the stream that contains Russian captions: enter the stream identifier into the field PID, or leave the field empty, if the value is Auto. Choose the language identifier in the field Language. Open the field Base Path and enter the name of the file folder that contains SRT-files. The format of files names is the following: Id_lang.srt, where Id is the name of the clip in the server database and the value in the playlist column Media respectively, lang is the language identifier. The file name shouldn't contain any special symbols. The text encoding is UTF-8. Mr_Popper_Penguins_eng.srt, where Mr_Popper_Penguins is the name of the clip in the server database. 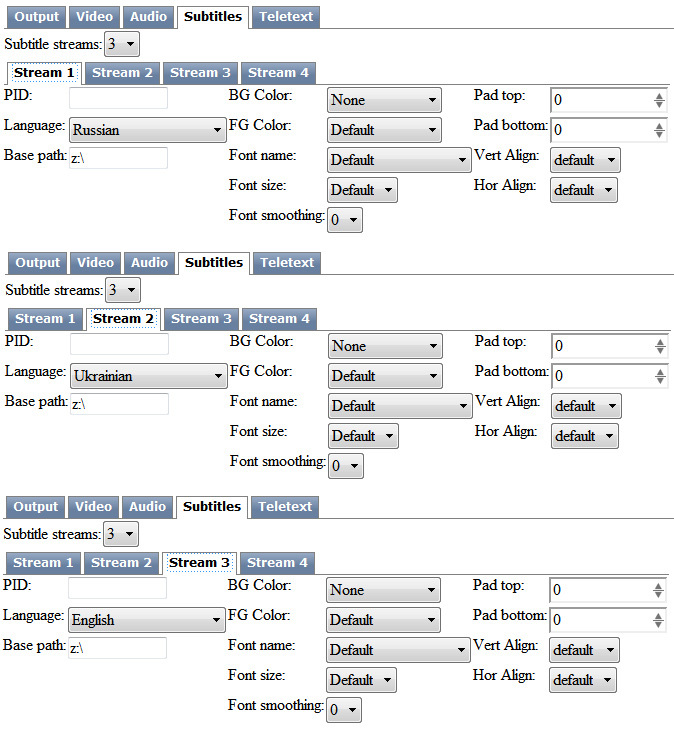 Examples of configuring the module AV/TS Player for three streams are described at the picture. You may separately configure the text parameters (location, color, size, font type, backing parameters etc). You may download the test AVI-file and SRT-files with captions by this link. The AVI-file contains three stereo pairs with different languages. You may find the information about adjusting the multi-language audio in the transport stream here. Adjustment of parameters of generating captions is finished. To save the configuration, click Apply Changes at the top part of the control console window. Herewith, the playout channel with the changed configuration will be reloaded, playback of the current channel will be stopped while reloading.